Jean-Guy Rimpel is not a running back many defensive players enjoy facing one-on-one. He bolts past, and often through, linemen, linebackers and defensive backs with ease. Oftentimes, he can only be stopped when he is tripped up or when multiple players tackle him. Speed and strength are traits that rarely work cohesively, yet they allow him to be an explosive figure in the backfield of the Stingers offence. And that’s why Rimpel is one of the best running backs in U Sports. Rimpel led the Réseau du sport étudiant du Québec (RSEQ) in rushing yards last year with 514 yards and four touchdowns. Two years ago, in his rookie season, he finished fourth in rushing with 432 yards and five touchdowns. In his two seasons at Concordia, the Stingers have failed to make it past the conference semi-final, but Rimpel has his eyes set on the ultimate goal: a championship. This off-season Rimpel said he pushed himself to improve on his weaknesses. “As a running back, I do make mistakes. I do drop balls, I do make the wrong reads sometimes, but I’m giving the hours to improve,” he said. Like many others on the team, including head coach Mickey Donovan and quarterback Trenton Miller, Rimpel echoed what seems to be the team’s unofficial motto this year. Jean-Guy Rimpel carries the ball against the Laval Rouge et Or during the 2016 season. Archive photo by Ana Hernandez. A former standout Division 1 all-star with the Collège Édouard-Montpetit Lynx, Rimpel has been proving he has the talent and drive to be a top player on the Stingers offence. During the first game of the season, against the Université de Montréal Carabins, Rimpel put up 42 yards on 14 carries with two touchdowns. However, the Stingers ended up losing that game 37-19. 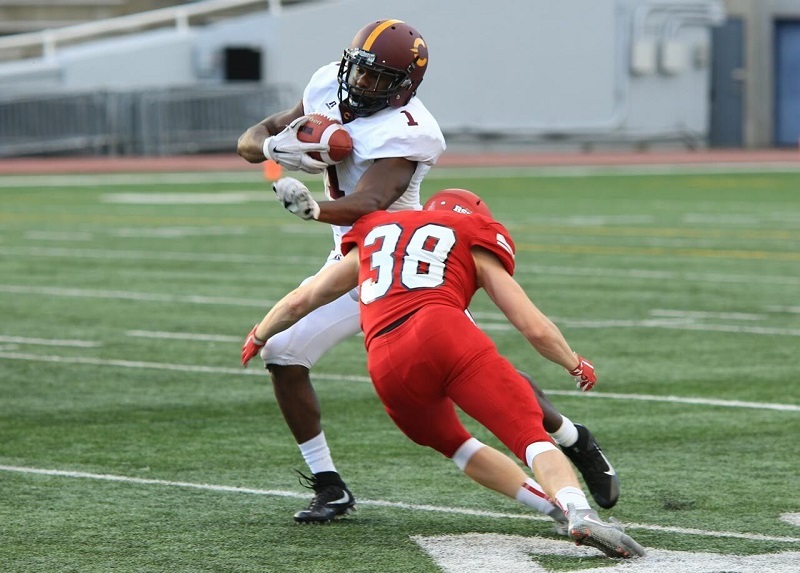 Rimpel and the Stingers bounced back with a 23-22 win in an away game against the Université de Sherbrooke Vert et Or on Aug. 31. Rimpel had 163 yards and 28 carries, and he scored a touchdown. Rimpel is familiar with the pressures of being a student-athlete. But he said he had some help from one of his role models, his older brother. For Rimpel, the end goal doesn’t seem to be set in stone. Main photo credit: Brianna Thicke.